Looks like Maggi has raised a generation of devotees who wouldn't listen to logic when it comes to MSG and it's being healthy, unhealthy or nonreactive in human body. I am amazed to see people who come up with 'facts' about MSG being natural and harmless, and how they have been using it for ages and are still alive. They forget the hormonal imbalances they are facing and the metabolic disorder that runs in the families. I have some experience in consulting people with metabolic disorders and letting them heal just by switching to real food only, the reason I can say with some surety that the food like objects thrown at us by the food industry are really harmful even though we don't realise to start with. But we start noticing when the odd symptoms of IBS vanish when we switch to real food, the hormonal disturbances that just felt like a bother start getting healed and we notice the better quality of life we experience. Better energy levels, better fitness and better lifestyle is compromised when junk food creeps stealthily on to the family dining table. Thankfully, if one realizes early and gives the body a chance, the body shows how it can heal with a little discipline practiced. The recent controversy about Maggi is a great opportunity to investigate into each packaged food you buy, and make informed choices. You may want to see a study that indicates how MSG and trans fats together cause fatty liver disease and continued intake of these keeps damaging cells, causes cell cycle and lipid storage impairment, hepatic inflammation. No prizes for guessing that MSG and trans fats are used together in most processed foods causing chronic dislipidemia. Stop being trapped into a cheap packet of Maggi. Start recognizing real food, the taste will surprise you and you would start looking for more good sources of ethically grown vegetables, fruits and grains, better sources of meat, poultry and seafood. Just don't be misled by claims that everything is polluted in this world and we don't have any choice but to dig into a bowl of instant noodle. Now let's see how do we make the real food simple, almost instant just like the instant noodles and delicious with the real taste, the way nature intended. Yes, there are some people allergic to eggplants (brinjals) too but I have myself seen how some people who were actually allergic to brinjals started eating them happily after their other diet habits were changed through a methodical personalised program, allergies sometime aggravate in the presence of other unnatural foods in the diet, once you remove those factors the allergies go on their own. 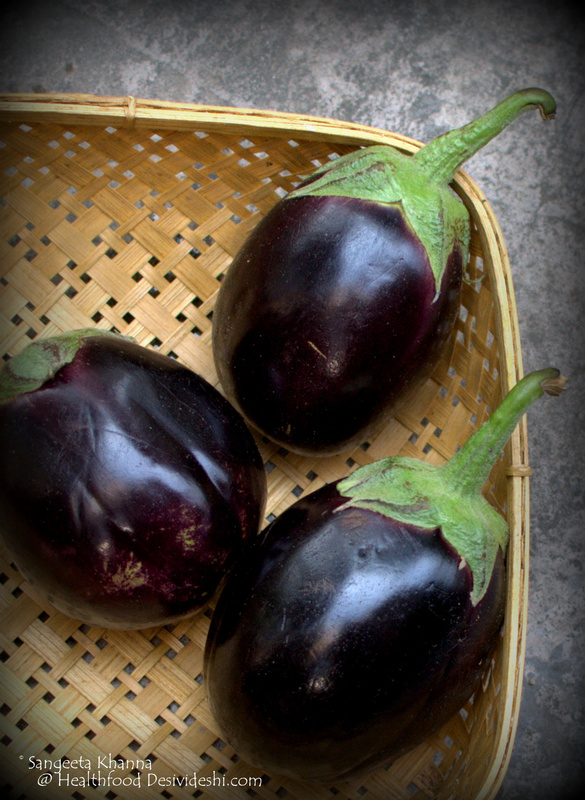 Eggplants or Aubergines are commonly called as Baingan in India. This vegetable gets mixed feelings in almost every country I guess. Some people who hate mushy vegetables never get the fortune to taste the subtle flavour that this buttery mush packs. But eggplants can be made into such delicious mush that you would start loving Baba ghaoush, Caponata, Grilled aubergines, Stuffed brinjals, Japanese style grilled eggplants and even Baingan ka chokha which is the simplest mashed vegetable we make almost twice a week. I am guilty of not sharing the baingan ka chokha recipe but I will correct that really soon I promise. Fat round slices of the same round variety of brinjal is shallow fried to make a 'Begun bhaja' which is a Bengali classic and I have adapted the Begun bhaja to make these open sandwiches for a hearty brunch or a breakfast when I want very little bread and loads of vegetables. Bread is always whole wheat and home baked. 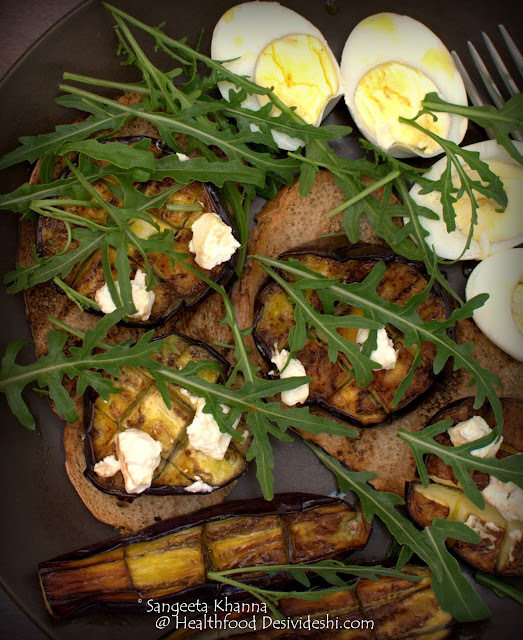 Open sandwiches with free form loaves make better sense and a topping like these brinjal rounds make it really irresistible. If I tell you there is no recipe for these sandwiches and that these are the yummiest sandwiches one can have, you shouldn't be surprised. Just make it once for the sake of ease and simplicity of this recipe and get addicted to the real pleasures of real food. Just remember to choose light weight fresh brinjals to make this sandwich topping. 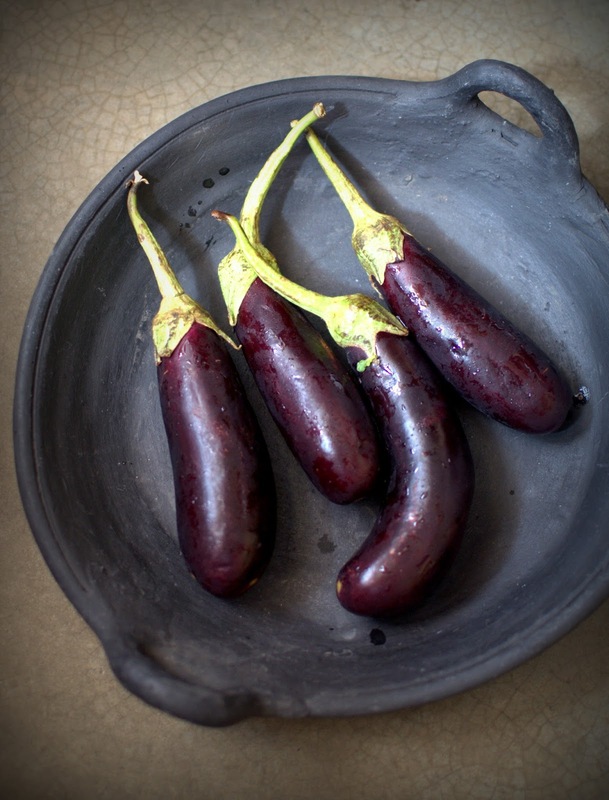 Slice the brinjals thickly, slash them lightly on one side and sprinkle salt generously over them all. Let them rest for at least an hour. Wash under running water and drain in colander. Smear a skillet with oil, spread the aubergine slices slashed side down, let them brown and then flip them to cook on the other side too. Drizzle oil as required. Drizzle with mirin or vinegar or lime juice once done and arrange over toasted bread. Smear feta cheese and top with rucola or other salad greens of choice. If making these for a larger crowd you might want to flash fry these brinjal rounds as shallow frying takes a bit of time and doing many batches can be distressing for the cook. Brinjals don't absorb oil when flash fried in really hot oil. If using the oblong variety of brinjals you can only slit the brinjal into two lengthwise and shallow fry as directed. You can also use the white or green varieties of eggplants (brinjals) for making these sandwich sliders or toppings. These greens ones grew in our garden for a few years till I removed the plants, this year we are starting to get slender purple brinjals. Minimal effort can bring so much natural flavours from real food. 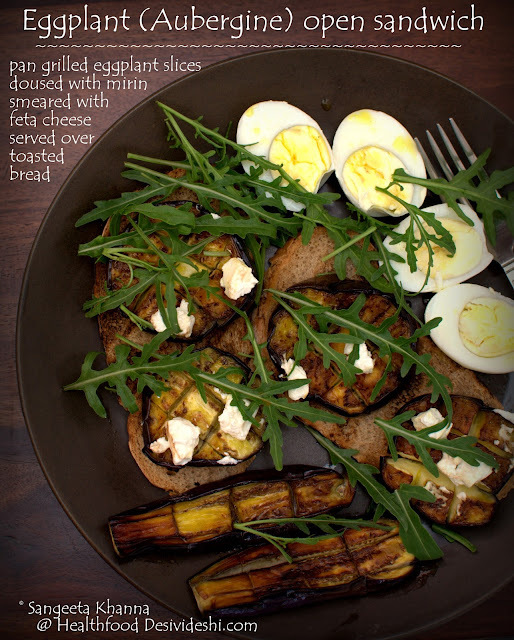 This brinjal sandwich will become a favourite with your family trust me. We even love a salad made with chunks of brinjal prepared the same way. 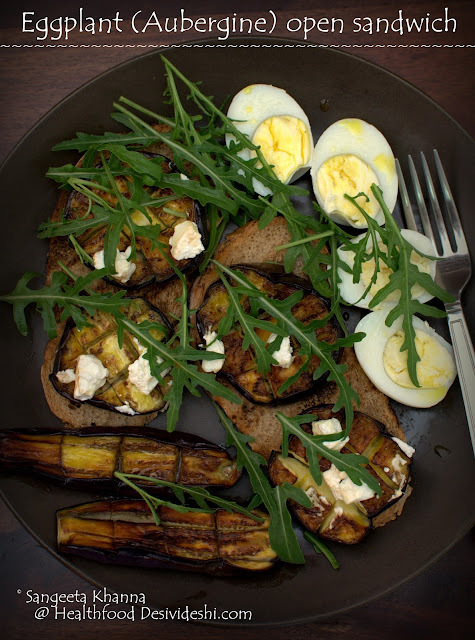 I will update those pictures of the brinjal salad here soon, we normally have it for a quick dinner and photography doesn't happen in such times. 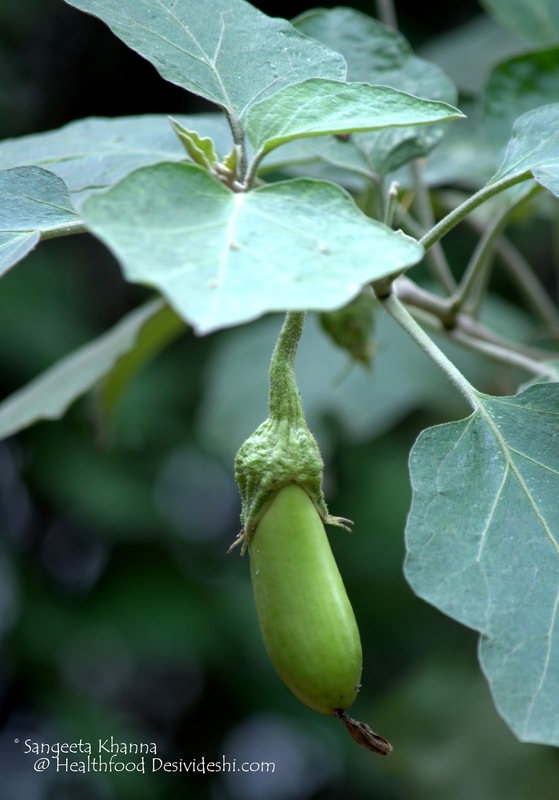 Tell me what interesting ways you like your brinjal? 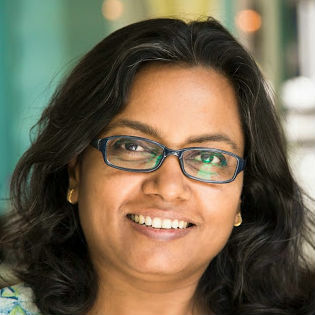 Stunning photos Sangeeta! And a recipe I'd definitely want to try.